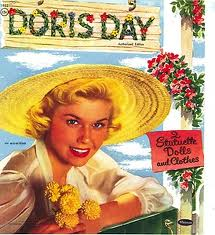 Over the years, numerous books have appeared in print talking about Doris Day, her life and her career. Some, like the book to your left, focusing on her hit songs. Those who play a musical instrument can actually play and sing along to some of the biggest hits in Miss Day's musical career. 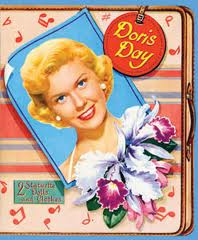 As of this writing, THE DORIS DAY SONGBOOK is also the most recent of all books devoted to Doris. Obviously the best place to start in an effort to find out the true story of Doris and her life is with the book she wrote herself, with the help of author A. E. Hotchner. 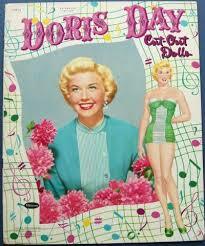 It was a best seller in 1976, and Doris appeared on many talk shows to publicize the book when it first came out. It ended up being quite a surprise to its readers: Doris was completely honest about her life and her feelings. One thing she dispelled was the image of her bright and always sunny image, quite far from the real truth. It is more like how she survived some real traumatic times in her life and still managed to end up smiling. 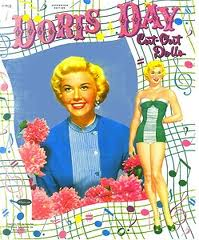 In 2005, the Iowa based author and popular documentary-maker Garry McGee published his in-depth guide to the work of Doris Day entitled “Doris Day: Sentimental Journey“. It is filled with pictures and important information about every aspect of Miss Day's career, an excellent source for those who are looking for statistical information on any aspect of her career from single recordings through movies and tv synopses. It is a popular book and was released in paperback edition in 2011, its fourth print version counting its availablity for devices like Nook and Kindle as well. This affectionate biography, which features previously unreleased pictures by legendary Hollywood photographer Leo Fuchs, looks at the actress' childhood, her fame as a singer and actress, the near-fatal car crash that ended her career as a dancer, her four marriages, and the passionate campaigns for animal welfare that are now the focus of her life. 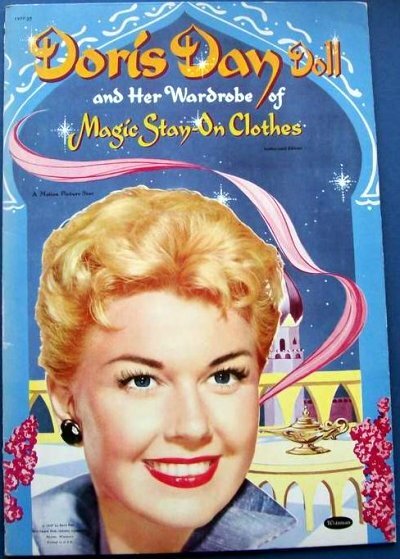 First published in 2004, it has had several printings and is considered by many fans as one of the best books written about the life and times of Doris Day. A revealing look at a star who was much more than just our favorite girl next door. The biggest female box office attraction in Hollywood history, Doris Day remains unequaled as the only entertainer who has ever triumphed in movies, radio, recordings, and television. But while on screen Day may have projected a wholesome image, her acting and singing range made her the role model for independent American career women for four decades. In Considering Doris Day, Tom Santopietro reveals why Day’s work continues to resonate today, both in ever-increasing record sales and Hollywood lifetime achievement awards. 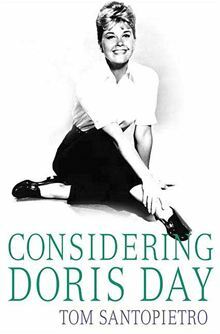 Placing Day’s work within the social context of America in the second half of the twentieth century, Considering Doris Day is smart, funny, and grants Doris Day her rightful place as a singular American artist. This book takes readers on a television journey. 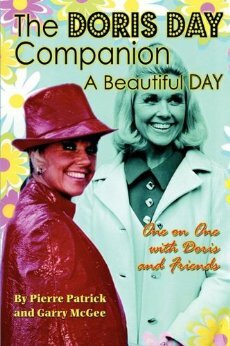 Included in this ultimate companion are amazing facts from the stylish hit series The Doris Day Show, which TV Guide called "A Beautiful Day." Also featured is a Mad magazine tribute to the series; a look into the Doris Day's Best Friends series; the secret love for the Doris Day music specials; an overview of Doris's classic films and shining albums; and an insight into the best of documentaries, film festivals, stage productions and new releases celebrating the ageless #1 superstar. In June of 2009, Patrick and McGee got together and revamped the book above and came out with a second edition (in paperback). The book, features over 400 pages and close to 200 photographs. 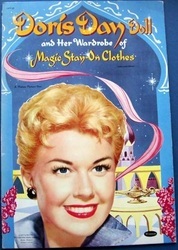 It includes a foreword by Jackie Joseph, who co-starred with Doris in two of the 5 seasons of the Doris Day Show on TV. In addition, an exclusive interview with Doris Day and her co-stars makes The Doris Day Companion a perfect caprice for the man or woman who never knows too much. Paul Brogan grew up in picturesque Concord, New Hampshire, a city that might have been an appropriate setting for a Norman Rockwell painting. From an early age he dreamed of going to Hollywood and working in the movies. That road to his dreams, however, was fraught with many detours and demons that threatened to derail not only his hopes but his life as well. "Was That a Name I Dropped?" tells in chilling detail a true story about growing up gay and battling depression so deep that suicide seemed like the only option available. Paul's road to Hollywood is colorful and filled with memorable moments and characters. His friendship with Doris Day often helped him through some of his most devastating incidents. His story is filled with interesting anecdotes about the many celebrities he encountered on his journey and gives hope to everyone who wants to make their own dream come true. Filled with stories about his friends and acquaintances especially Doris Day, and including Katharine Hepburn, Elizabeth Taylor, Carol Channing, Eileen Fulton and Jim Bailey among others. A little boy of 8 years old was overwhelmed by his first in person sight of songstress Doris Day when she was appearing with Les Brown and his band in the mid 1940's. This experience affected his entire life. At 76 years of age, Michael (Mike) DeVita of Baltimore, Maryland is still corresponding with the love of his life. In fact, she sent him a special letter congratulating him at his Surprise 75th Birthday Party. In the mid-summer of July (2012), Mike released his first book...it is written as a memoir of this life-long devotion. He called it "My 'Secret Love' Affair with Doris Day". "Secret Love" is, of course, one of Doris' biggest hits, an Oscar Winner from "Calamity Jane". One line from the song, "and my secret love's no secret anymore" aptly applies to Mike's book...now any reader of the book knows his secret. As for the "affair", the word is also defined as "a strong admiration", very fitting. A teacher of English and Theatre Arts for over 33 years, Mike was encouraged by both friends and former students to write a book, something he always wanted to do. Doris gave him the impetus to do so, and that life-long devotion gave his story its holding factor. Along the way, readers learn not only about Doris and her amazing career (especially her musical one) but also about Mike and his own career. The author has said that he hopes readers enjoy his story and will tell others about it. 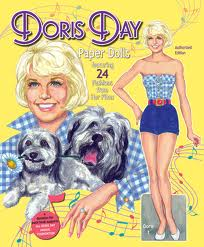 He has assigned all proceeds from sales of the book (in any format) to the DDAF (Doris Day Animal Foundation). It is, after all, what most motivates Doris these days, and her foundation has done wonders for animals all over the world...This is an effort everyone should support fully. As Doris has said, "the poor babies cannot speak for themselves."